One of the most popular dishes of Russian cuisine – meat and fish cakes, the recipe and the secret of their making each family your. Depending on the method of cooking – fried in fat or oil, steamed – they can be very hearty and high in calories, and dietary dish. Therefore, they can be found in the menu of those who want to lose weight. Garnish also can be selected depending on use and caloric content. When cooking a side dish note: no matter how tasty your chops, garnish it also needs to be delicious. This is a separate full dish that not only emphasizes the taste and aroma of the meatballs, but complements them. A classic side dish that can be submitted as meatballs made from minced meat, and those that used fish is mashed potatoes. It was beautiful and delicious, try to achieve a smooth consistency using a potato masher. Be sure to add the milk and butter. Some Housewives add to the mashed potatoes and whipped raw egg. Feeding mashed potatoes with fish or meat cutlets, put in a bowl a spoonful of canned green peas, sprinkle with finely chopped fresh herbs. Young boiled potatoes will also be a great side dish to burgers. Boiled rice also goes well with meat and fish patties. But it is not necessary to cook as a porridge. Cook the rice for garnish in a frying pan. First, sauté it in a small amount of vegetable oil, then cook, stirring constantly and adding as they absorb 70-100 g of vegetable, fish or meat broth. Don't forget to put spices. When the rice is almost cooked and only the middle will be slightly damp, turn off the stove, add the broth, tightly cover the pan with a lid and leave to simmer for another 10 minutes. It is not necessary to apply for a side dish to burgers fries that will be a pretty tough test for your liver. With cutlets of meat you can serve pasta or noodles, adding this side dish of creamy butter. As gravy, you can use the juice that remains after frying the cutlets, but you can make a separate sauce, for example, fry onions with carrots and fresh tomatoes and then put out slightly over low heat. Submit cutlets with garnish can complement the dish with some pickles: sliced pickled cucumber, a spoon of sour cabbage, salted tomato. Such side dishes as well as burgers can be very tasty, and are prepared much faster. 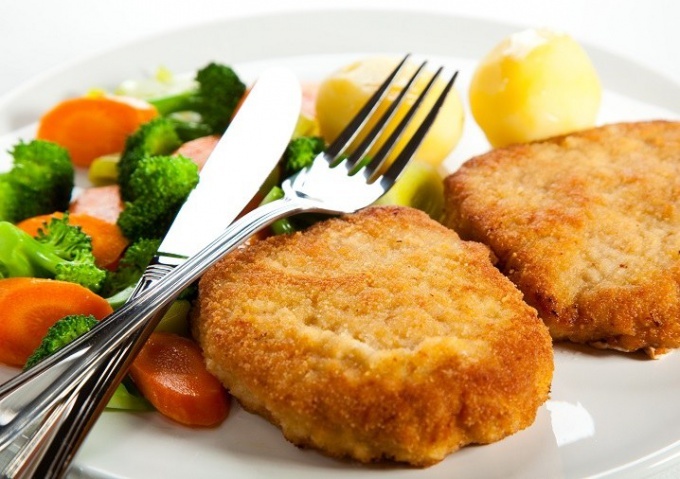 And the meat and fish chops can best serve vegetables, the same young boiled potatoes. If it's a frozen vegetable mix, lightly boil the vegetables in boiling water (3-4 minutes), drain them in a colander, place in a pan with a little olive oil and just heat, not fried. Add the spices and a pinch of salt. If the diet is strict, the stage with the pan skip. This way you can cook and green beans, and cauliflower or broccoli. For diet meals as a side dish suitable fresh vegetables in a salad or just sliced large pieces. Never hurts green leaf lettuce and a few sprigs of fresh herbs. Chicken breast – meat diet. It contains a small amount of fat and has low calories. Chicken breast is a carrier of a large number of essential human body vitamins and minerals. Meat helps to improve digestion, to lose weight. It is a component of many diets and a major component of the protein diet. Too much protein intake may also lead to the body. Therefore, all we need to know the measure. Choose a chicken breast is not difficult, if you know the basic rules. When buying meat, pay attention to its color – it should be homogeneous, without blood evidence. The elastic structure is a qualitative indicator of the breast. If you press your finger on the meat, long the trail disappears, then it was re-frozen. The product can be stored for no longer than 5 days at a temperature from 0 to +2 degrees. Otherwise it loses its usefulness. Pay attention to the smell, appearance and storage conditions of the product. These are the most important factors. Chicken breast is the most tasty part of the diet of the hen. You can cook it in various ways. The main rule of which is – do not overdry, as this type of meat contains little fat. The dish turned out juicy and useful, add vegetable oil, sour cream, olive oil or other fat. To maintain the usefulness of meat cook it or bake it in the oven. From Breasts you can prepare the rolls with different fillings, delicious and nutritious soups, burgers and snacks. Chicken goes best with a variety of side dishes. The chicken breast is well served with toppings. Most useful diet vegetable side dishes. For example, salad or Peking cabbage, mixed with fresh cucumbers, tomatoes and greens well suited to boiled or roasted chicken breast. Fill this salad with olive or sunflower oil. Bake in the oven sliced potatoes, courgettes, carrots, cabbage and tomatoes. 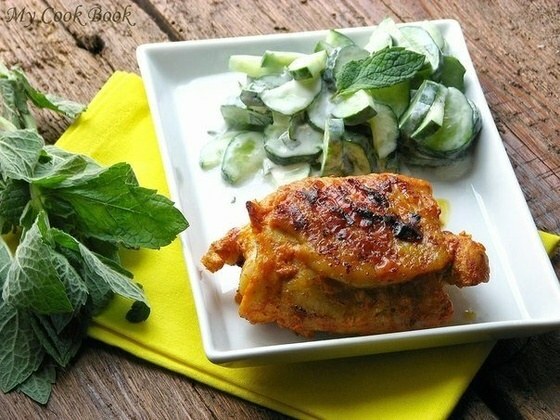 Serve hot with chicken breast. To prepare more nutritious garnish in salted boiling water, drop the asparagus and cook until tender. White asparagus is cooked for 10-15 minutes, and the green is 3-8 minutes. Any mess will be a good side dish for chicken breast. In salted water, lower rump and cook it until tender. Use as a side dish with pasta or spaghetti. To do this, cover them in boiling water and cook for 10-15 minutes after re-boil. Cooked pasta mixed with grated garlic and cheese. The most simple, standard and tasty side dish to meat is mashed potatoes. Cook the peeled vegetable in salted water, then drain the soup and crush them with milk. Potatoes with a chicken breast can be served boiled, and fried. If the meat is boiled, garnish fit more calories. Roast breast best served with vegetables, seasoned with oil. Importantly, both the meat and the side dish was prepared with love.